It’s OOH Yes’ one-year anniversary, which has naturally made us all misty-eyed as we look back on what’s been a whirlwind 12-months for the UK’s freshest outdoor planning specialist. Born out of a frustration towards the way classic and digital out-of-home (DOOH) campaigns were bought, the formation of OOH Yes signalled a new era in outdoor planning. Led by the mission of bringing the medium’s power to start-ups, small businesses and entrepreneurs, founder and managing director George Rossides sought to revolutionise the market with a flexible, analytically-powered service. Treading its first steps in October 2016, within months the company had laid the foundations for the success that was to follow, forming robust partnerships with independent agencies Guerillascope and Kong Media. Offering a bespoke planning and buying solution that harnessed the latest technological advancements to incisively cut through the noise, OOH Yes was soon attracting attention from brands seeking greater control and creativity in their OOH and DOOH strategies. SameDayDoctor was one such brand. The company, a private GP clinic offering same day appointments within minutes, wanted to target busy office-based professionals with intelligently positioned out-of-home creatives printed on prescription packaging. 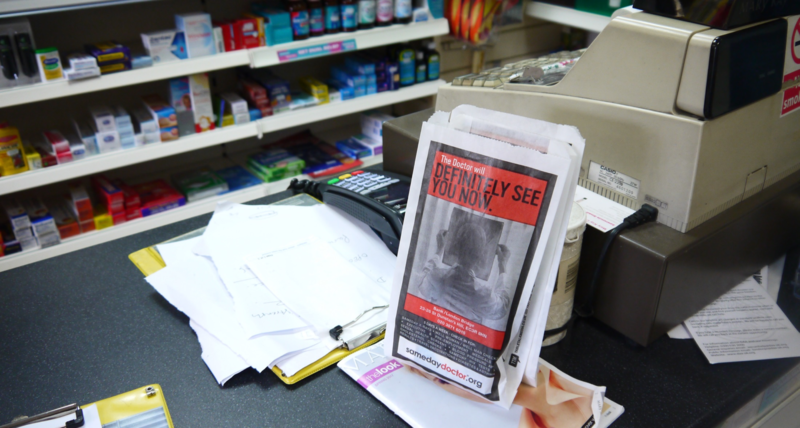 The campaign was implemented in 107 pharmacies across London, with 1,000 pharmacy bags used. Then there’s Ellesse. The resurgent sportswear brand wanted to run a DOOH around 2017’s Wimbledon tennis, but was dealt a blow when Dan Evans, the British tennis star who was at the centre of the campaign, was forced to pull out of the tournament at the eleventh hour. In a demonstration of the flexibility now available to advertisers through DOOH, OOH Yes was able to replace the original creatives with a new range featuring rising star Cameron Norrie in just five hours, without wasting a penny of Ellesse’s budget. One of our biggest successes of the last year has been Amazon Jobs. Approached with the task of driving recruitment in and around specific centres, we delivered a combination of classic OOH, DOOH and guerrilla OOH (petrol pumps, 48-sheet vans), targeting locations identified by the brand. The campaign was hugely effective, driving a huge uplift in job applications. We are now aiming to build on this with further outdoor activity across several major European cities. Amazon, Ellesse and SameDayDoctor have been joined by the likes of Schuh, DC Shoes, Quicksilver and new mobile cryptocurrency Electroneum – a global first in both the altcoin and outdoor industries – over the past twelve months. Indeed, whilst fiercely confident in the proposition we were offering, we still can’t believe how quickly OOH Yes has taken off. We’ve devised regional, national and international campaign strategies, spanning classic and digital formats, from billboards to Taxis, Tube lines to petrol pumps – it’s been a blast! All that’s left to say is thank you to everybody who has worked with us in the last year– you’ve contributed to twelve months that none of us at OOH Yes will forget. This entry was posted in DOOH, Out-of-home, Outdoor and tagged OOH Yes, outdoor advertising. Bookmark the permalink.